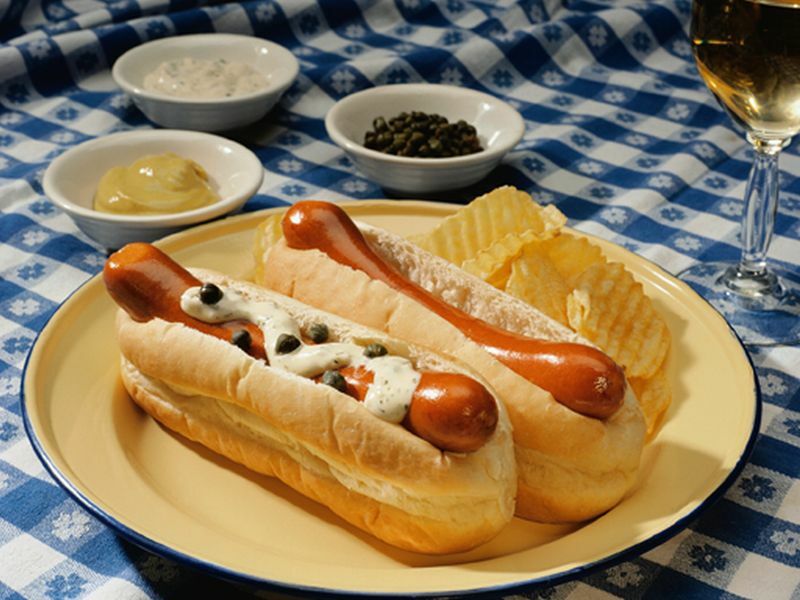 WEDNESDAY, April 20, 2016 (HealthDay News) -- Alcohol, processed meats -- such as hot dogs, ham and bacon -- and excess weight all may raise a person's risk of stomach cancer, a new review finds. Further, the risk seems to increase as a person drinks more alcohol, or eats more processed meats or gains more weight, the review states. It was released Wednesday by the American Institute for Cancer Research and the World Cancer Research Fund. The review concludes that in the United States, about one in seven stomach cancer cases could be prevented if people did not drink more than three alcoholic drinks a day, did not eat processed meat and maintained a healthy weight. That's approximately 4,000 stomach cancer cases every year. "This is the first report to find strong evidence of these links," said Alice Bender, head of nutrition programs at the cancer institute. "There are things we can do to lower our risk for cancer. There are choices we make every day that can make a difference." However, the report did not prove that these factors cause stomach cancer; it only showed an association. Three or more alcoholic drinks per day every day increases risk of stomach cancer. A standard drink is 12 ounces of beer, 5 ounces of wine or 1.5 ounces of distilled spirits, according to the U.S. National Institutes of Health. For every 1.8 ounces of processed meat eaten every day -- the equivalent of one hot dog or two slices of bologna -- the risk of cancer in the lower stomach rises by 18 percent. Every five-unit increase in body mass index -- BMI, a ratio of weight to height -- causes a 23 percent increased risk of cancer in the upper stomach. Stomach cancer is the fifth most common cancer worldwide and the third most common cause of death by cancer, the report stated. Just last October, the World Health Organization determined that processed meat can cause cancer. Nearly 1 million new stomach cancer cases are recorded each year around the world, accounting for 7 percent of all new cases of cancer. The five-year survival rate is 25 percent to 28 percent, largely because symptoms only appear at a late stage, according to the report. Men are twice as likely as women to develop stomach cancer, and it is more common in older adults. The average age at diagnosis in the United States is 72, the report added. For the report, researchers combined and analyzed all scientific data available on stomach cancer, diet, physical activity and weight. The analysis included 89 studies covering 17.5 million adults, including 77,000 with stomach cancer. "You usually can't take the result of a single study as proof. You like to see patterns," said study co-author Dr. Anne McTiernan, an epidemiologist with the Fred Hutchinson Cancer Research Center in Seattle. "By combining all this evidence, you're able to really see what these associations look like." The researchers took an additional step by looking at how the risk factors affected the two different types of stomach cancer -- cancers of the upper stomach near the esophagus, and cancers of the lower stomach. Overweight and obesity appear to increase risk of upper stomach cancer, possibly because the excess weight causes acid reflux that irritates the lining of the upper stomach and esophagus, McTiernan and Bender explained. It's also possible that excess fat increases cancer risk because it promotes the release of hormones such as insulin, human growth factors and other inflammatory chemicals into the bloodstream, they added. On the other hand, alcohol and processed meat appear to mainly increase the risk of lower stomach cancer, the report found. Processed meats contain preservatives like nitrates and salt, or byproducts like polycyclic aromatic hydrocarbons (PAHs) when smoked. These have previously have been linked to cancer risk, McTiernan and Bender said. "We can't pinpoint any one thing, but there are a number of plausible mechanisms why processed meat would increase the risk of stomach cancer," Bender said. Alcohol also has been linked to the risk for other types of cancer, McTiernan added. Bender noted that alcohol might serve as a solvent that helps carcinogens get into a person's cells, or that the body might break alcohol down into pro-cancer substances. People might want to consider processed meat a once-in-a-while treat based on these findings, said Marji McCullough, strategic director of nutritional epidemiology for the American Cancer Society. "People should lower their intake of processed meat and consider it something they eat more on occasion, rather than a regular part of their diet," she said. On the other hand, current guidelines already restrict alcohol consumption to one drink daily for women, and two drinks daily for men, so people sticking to that wouldn't have to change their habits. "If you follow current cancer prevention guidelines, that would definitely be consistent with this report," McCullough said. Experts differed on whether these individual risk factors can combine to increase a person's odds of developing stomach cancer. For example, would a person who drinks alcohol and eats processed meat have a greater risk than a person who only drinks? McTiernan said that risk factors often overlap -- like the fact that drinkers also are more likely to smoke. "It can be hard to tease those apart," she said, making it difficult to tell whether the risks add up or not. But several studies have shown that if people adopt multiple cancer-reduction strategies in their everyday life, they have a reduced risk of either developing or dying from cancer compared with people who only adopt a single strategy, McCullough said. "It does seem the more healthy things you do, the more benefit in terms of lowering risk," she said.